EHR systems are extensively used by healthcare organizations thanks to substantial benefits that they bring: improved information exchange and access to clinical data, easy navigation, error reduction. In the US these solutions lie in the heart of the healthcare reform, and the adoption of EHR solutions by the local hospital community is almost complete. Healthcare organizations need a software product that can align all the electronic processes with their internal workflow. Purchasing the right EHR platform is a challenging task for medical organizations. Each business is unique, and needs may vary depending on an organization type and its size, aims and objectives. Healthcare business owners usually get stuck when they start choosing between an out-of-the-box product and custom software. Let’s take a careful look at pros and cons of these solutions to see when they are appropriate. Being industry-specific, these solutions are likely to meet most needs of an organization. Reasonable up-front costs. Development costs are distributed throughout a large number of end-users. These out-of-the-box products are an attractive option for those who have a limited budget. Ready-made solutions have many features that a business may start using later on as it evolves. End-users can be sure that any software problems will be timely addressed as vendors often provide support and maintenance services. 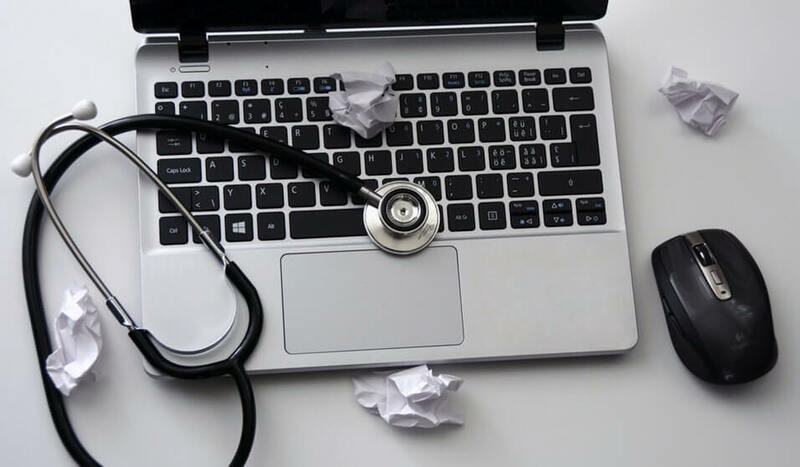 Medical specialists do not always need the full functionality of off-the-shelf EHR solutions or may need other features that are not on hand. For example, caregivers who are too busy to enter information on new patients could benefit from using the voice recognition technology, but a limited number of ready-made EHR products have such a feature. Customers may task the vendor or a third party to add some functionality to the system. But this always means extra expenses. Still, these expenses are not as high as when it comes to custom software development. Healthcare organizations have to pay for upgrades, support services, different licenses, etc. So, the solution’s final cost may be higher that the customer expected. Sometimes ready-made applications may fail to comply with in-house security requirements or end-users’ hardware may be not powerful enough to run them smoothly. EHR software users may lose much time becoming familiar with the software and learning how to utilize it. Custom solutions will have all the important features and functionality that the business needs. End-users do not spend much time getting acquainted with the product, as custom software developers pay close attention to customers’ business processes and needs while working on the solution. Custom products perfectly fit end-users’ security, software and hardware needs. No additional or licensing fees are required. The customer pays only once. The vendor provides direct support to its products, and all the problems are solved quickly. Custom products are usually associated with high prices. Small-sized businesses can hardly afford paying high upfront costs, and they make it work with ready-made products. Software development is a lengthy process. Healthcare organizations must understand that they will not get a desired solution in a week or two. They will be able to start using the product in at least a couple of months. The customer may choose a wrong developer that lacks relevant expertise and experience, e.g. a software company that have never created custom EHR systems. Organizations may have to pay for new features if they want to add them to the solution. EHR systems are in great demand among medical organizations. End-users are spoilt for choice as there is an extensive array of vendors offering ready-made EHR systems and those who create custom software. It is not easy to choose between off-the-shelf and custom EHR platforms. Pros and cons described above can help healthcare business owners make a wise decision.